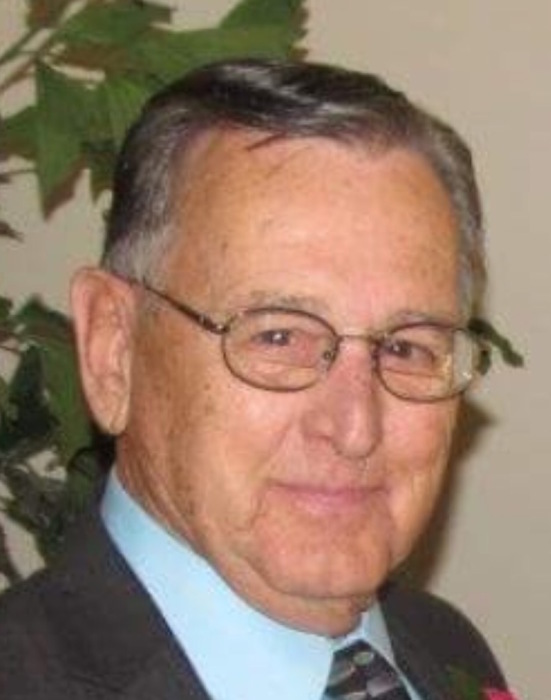 Merle S. Lotz, 86, of Metamora, IL, formerly of Streator, IL passed away at 11:30 am on Wednesday, January 30, 2019 at Snyder Village in Metamora. He was born on August 1, 1932 in Streator, IL to Elmer W. and Pearl C. (Mandelco) Lotz. He married Lucille A. Chalus on September 29, 1957 in Ottawa. Surviving are his wife Lucille of Metamora; daughters Morene (Steven) Thompson of Tremont, IL, Renee DuBois of Metamora, and Anni Howells of Bonney Lake, WA; twenty-three grandchildren; and twenty-two great-grandchildren. He was preceded in death by his parents and grandson Blake Heman. Merle was known for his firm handshake, his winning smile and his winsome ways with people, animals, and even machinery. He grew up driving grain trucks and tractors on farms around Streator and Ottawa. It was there, in the middle of a cornfield, where he met the love of his life, Lucille, his beloved wife of 61 years. While serving in the Navy during the Korean War, Merle operated all kinds of heavy earth moving equipment as a proud member of the Seabees. Stateside, Merle went on to drive motorboats, motorcycles, 7UP delivery trucks, countless hours on the road as a salesman for IFP, and even a Greyhound bus. Merle had a life-long love affair with farming which he indulged by helping others and by tending 16 acres on the Vermillion River where he raised horses, old tractors from the scrap heap and three beautiful daughters. Together, the family baled hay, painted fences, trained horses, tended pigeons, rescued and restored old equipment, helped out the neighbors and performed countless other chores. After selling the farm, Merle and Lucille moved to a house on the Illinois River where they quickly became cherished members of the lake community. Later they moved to Germantown Hills before finally settling in a cottage at Snyder Village. A talented woodworker, he gifted many unique handcrafted items to his children, grandchildren and great-grandchildren. While Merle’s time behind the wheel eventually down shifted to a golf cart, his firm handshake, winning smile, and winsome ways never did. The family would like to extend special thanks to Dr. Whitford and his entire nursing staff, especially Krista. The family is grateful to those from home health care and to Trisha from hospice along with all those who prayed for and ministered to Merle in so many loving and compassionate ways. Cremation rites have been accorded. A Memorial Service will be held at 2:00 pm on Friday, February 8, 2019 at Christian Union Church in Metamora with Pastor Gary Salm officiating. Visitation will be held from 12:30 pm until time of his service on Friday at the church. In lieu of flowers memorials may be given to Christian Union Church, 925 West Walnut Street, Metamora, IL 61548 or Snyder Village, 1200 East Partridge Street, Metamora. Online condolences at www.masonfuneralhomes.com.